The image above shows our reaction to the 2018 federal election (aka “Blue Wave”) via letterpress. 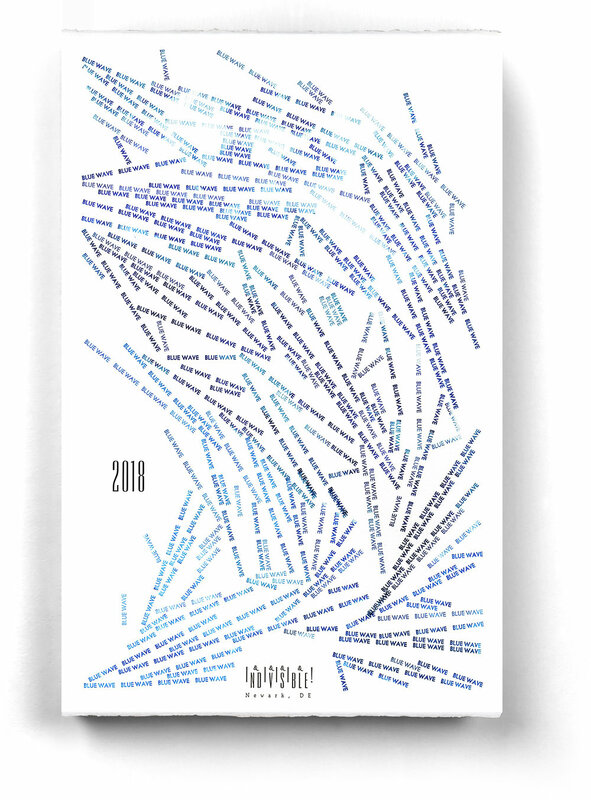 We are selling these broadsides for $90 with 100% of the profits going toward mailing costs for our POST-ELECTION POSTCARDS PROJECT (explained below). For the past year, as part of our letterpress & creative work, we’ve been producing a series of postcards we’ve sent to all of the U.S. Senators (both Democrat and Republican). So far, we’ve produced approximately 400 copies of each of 21 cards listing “Indivisible / Newark, DE” as the client. We were interested in contributing to the resistance through Indivisible and the postcards were a good excuse to put ink on paper. We started with INDIVISIBLE in October of 2016 and over this past year leading up to the 2018 election we sent approximately 3,830 through USPS and also have likely given away another 2,500 to visitors, APA, and workshop attendees. Based on the POSITIVE outcome of the election, we are going to refocus our political postcard effort and have produced a 5-run broadside we are selling for $90 to pay for stamps. For at least for the next 2 years, we will continue to produce at least a postcard a month that will be sent to all Democratic & Independent members of both the U.S. House of Representatives (240) & the U. S. Senate (47), along with all like-minded members of the Legislature for the State of Delaware (40), people who bought the “Blue Wave” broadside (40), media people (30), and friends (50) equals about 440 postcards a month. Current price for postcards is 35¢, so a single mailing is $154. Typically, we print about 200 - 300 extra which we give out in our student to workshop attendees and the like. We want to encourage creative thinking and to right the course of the United States to help improve to a greater degree all the lives of our and other world citizens who look to us as a beacon of doing good things. We mentioned above that we were selling the Blue Wave broadside for $90. So if we could sell 48 of the 60 broadsides that would cover postage for a mailing a month for the 2 years until the 2020 election. Help us out. Lead Graffiti will supply the paper and the effort required in typesetting & printing. Support with paying the postage will help.